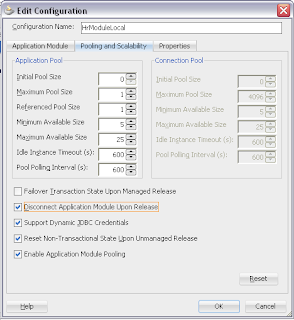 Leave the jbo.doconnectionpooling configuration parameter set to false for best performance without sacrificing scalability and reliability. Database connection pooling is still achieved through application module pooling. 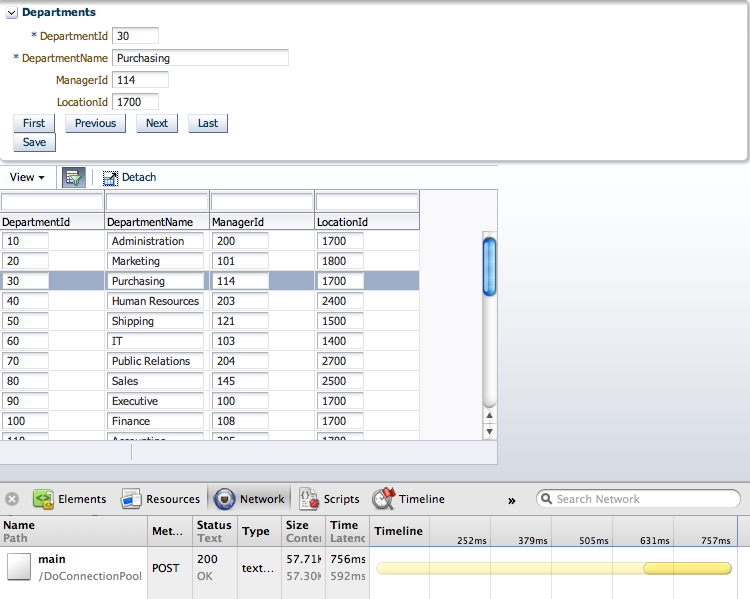 The only exception is when multiple application module pools (and therefore a large number of application module instances) share the same database, making the total available database connections the highest priority. 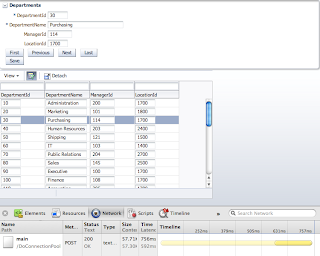 However, when minimizing the total overall number of database sessions is a priority, one situation in which it might be appropriate to use database connection pooling is when you have a large number of application module pools all needing to use database connections from the same underlying application user at the database level. 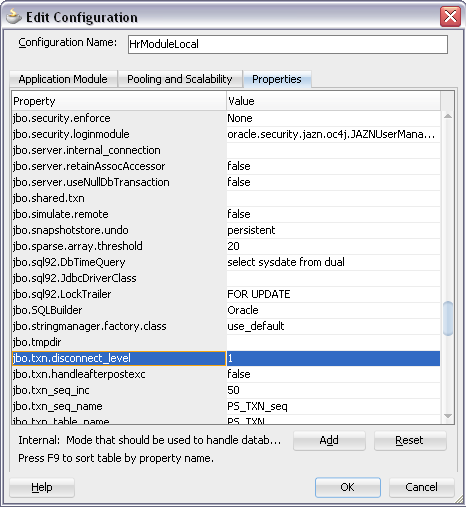 Alternatively, you can set jbo.txn.disconnect_level=1 (default is 0) to ensure that all application modules, view objects and row sets remain in memory and stay valid after their corresponding references to JDBC connections are dropped. Upon activation, the framework reexecutes and synchronizes the cursor positions. When used in conjunction with jbo.doconnectionpooling=true, setting jbo.txn.disconnect_level=1 reduces the memory overhead associated with this situation. I did couple of experiments, to test how these different settings affect application performance. 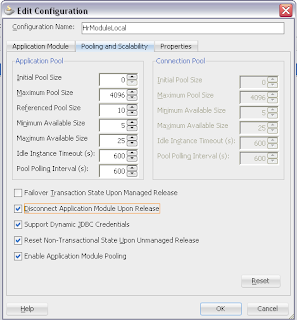 Download sample application with database connection pooling and virtual memory for AM instance enabled - DoConnectionPoolingApp.zip. This means, even when database connection pooling is ON and virtual memory is ON, passivation/activation mechanism still works - when there is not enough space inside AM pool. Thats good, try to apply jbo.doconnectionpooling = true and jbo.txn.disconnect_level = 1 and test to see positive/negative effect in your project. It's a valuable post Andrejus, thanks for posting it. You'll remember from recent blog entries I demonstrated the changing nature of BTF automatic AM nesting between 11.1.1.X and 11.1.2.X. In the later AMs of child BTFs are no longer auto nested under the parent BTF's AM, all become a root AM. This means our application if using an AM per BTF when moving to 11.1.2.X will suddenly use a huge amount of db connections. I was having a bit of a further think about this over the weekend. 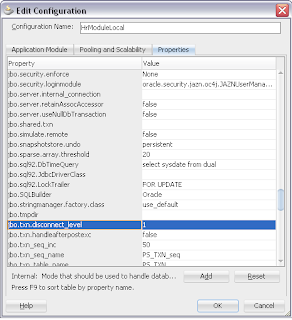 Setting jbo.txn.disconnect_level=1 which causes the state of VOs and more to be placed in memory wouldn't be suitable for a clustered/failover environment would it? Presumably ADF relies on the ADF memory state to be stored in the database passivation store to support failover? With such setup, it behaves as it would ignore jbo.txn.disconnect_level = 1. As expected, it performs passivation after each request - in order to support cluster failover. 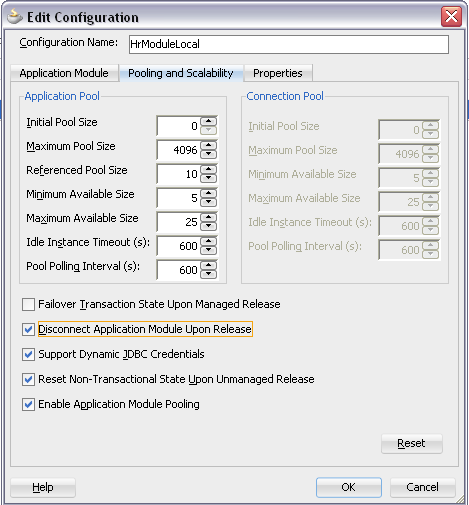 However, because jbo.doconnectionpooling = true, it still able to release DB connections back to the pool - as it is with single node environment. Thanks for the great tip, up there. I noticed a rather strange behavior which I would like to share with you. 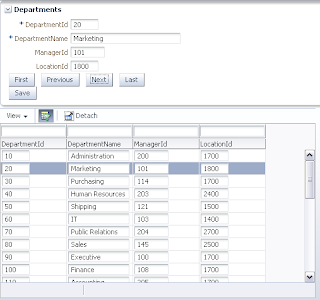 Say we have a application with one AM and a single view object, connected to database through a datasource. I have two view controller projects say VC1 and VC2 sharing the same model. I created two pages in each of the viewController project as follows. 1)In VC1,P1 Normal JSPX page with the view object used in it. 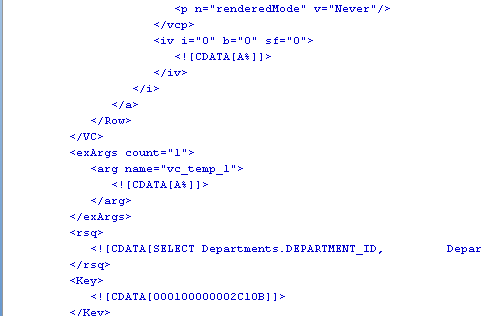 2)In VC2,P1 Normal JSPX page with a inline frame calling the P1 in the VC1 through URL. Every time I refresh the P1, only one connection is used every time. But when I refresh the P2, for every refresh one connection gets added up. The only difference in P2 is the using the INLINE FRAME calling the URL in other project. But y is that creating new connections instead of using the existing one like P1. Hard to answer correctly, without seeing sample code. You can send it to my email, I will look. Generally using INLINE FRAME is bad practice. I have mailed you the sample, It is actually your sample with little bit modifications. Yes, I reproduced your behavior. As I said earlier, this happens because of Inline Frame. 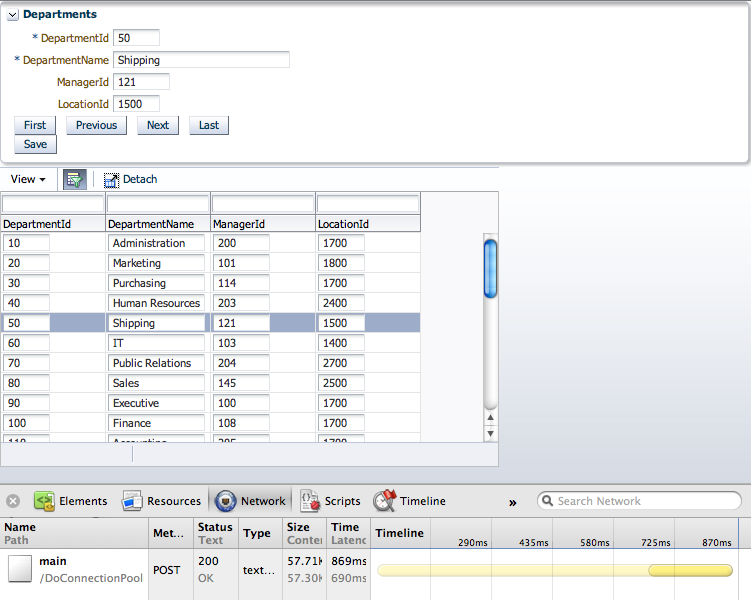 Its very bad practice to use Inline Frames, when browser refresh happens it loads new session for Inline Frame. Its why new AM instance is created. In our application we use INLINE FRAME predominantly for calling the jspx from one viewController to another viewController. So could you suggest an alternative for the INLINE FRAME so many AM instances are not created for the single user session. 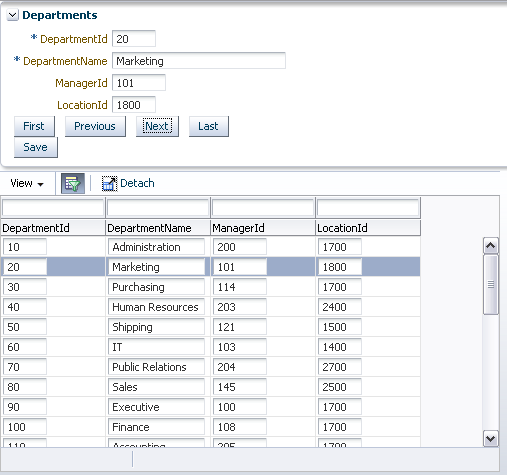 Use ADF Libraries and include Task Flows through ADF Regions. 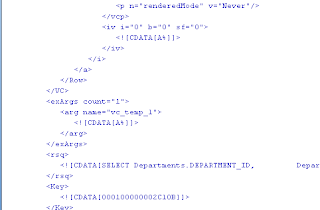 If we use model through ADF library, which DATASOURCE will it take. Say I have a application with DS1 and I import another application which has a model project of its own with DS2. 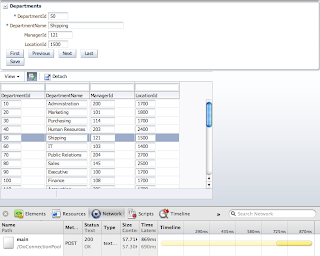 Which datasource will the view objects form the library take in the runtime. It will take both DS1 and DS2. 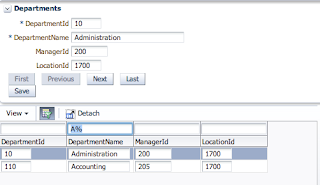 View Objects are not taking data source, but Application Module. If two Application Modules are defined with DS1 and DS2, those two data source will be used on runtime. Andrejus I have been testing these settings to free up db connections. what i am seeing is with the ordDocDomain attribut for file uploads that the metadata seems to be persisted but the actual file is not uploaded. Can we connect to two connection in one application. For eg. I login to one application and then moving to one of the jsf page, can we have a button "Another Conn" which will connect to another db. Can this be achieved in ADF 11g. What if we set the issupportspassivayion=false? Say if we have 600 concurrent users are accessing my application, how should we define the parameters for connection pooling ? Also, how to simulate this scenario to test, during the development time? You can simulate using JMeter. We have a AppModule which consits of 3 VOs. 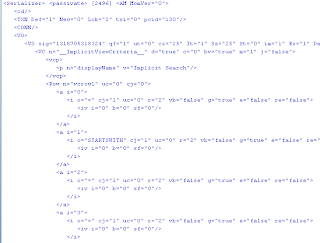 All VOs are static/rows populated programmatically. And tall the VO's consists of transient attributes. So everything works fine in Development environment. However it does not works properly in a clustured envirnment. Can you please point out what changes I need to do. You should enable failover and implement passivation/activation support for transient VO's. 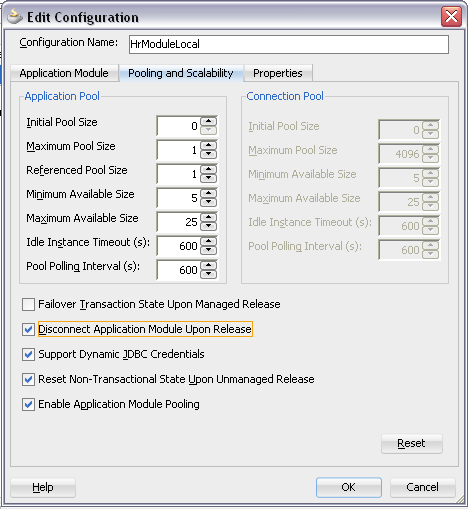 So all the options under configurations under pooling and scalability are checked now. And regarding transient VO. I have checked the "include all transient attributes" under passivate state of VO. So, are these changes sufficient for the clustered environment testing. 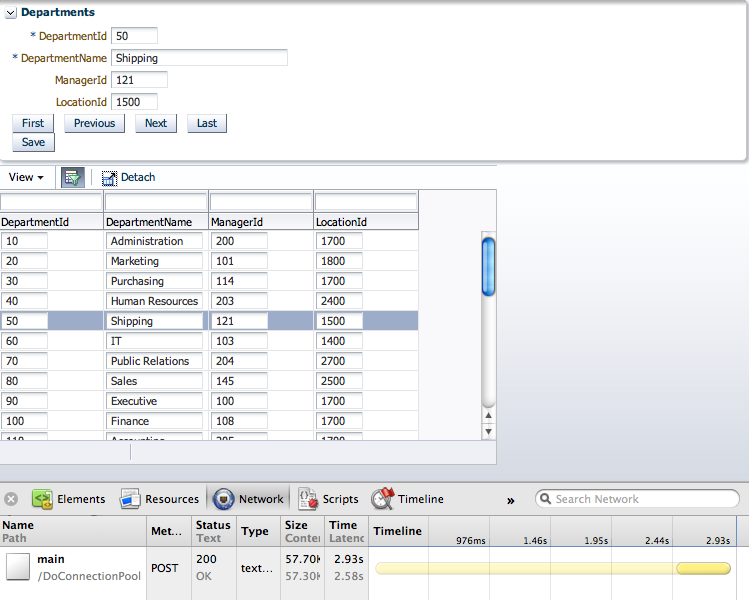 Note: All the transient attributes which only used for showing data in pivot table. So now on the VOs I have marked passivate state under VO tuning. 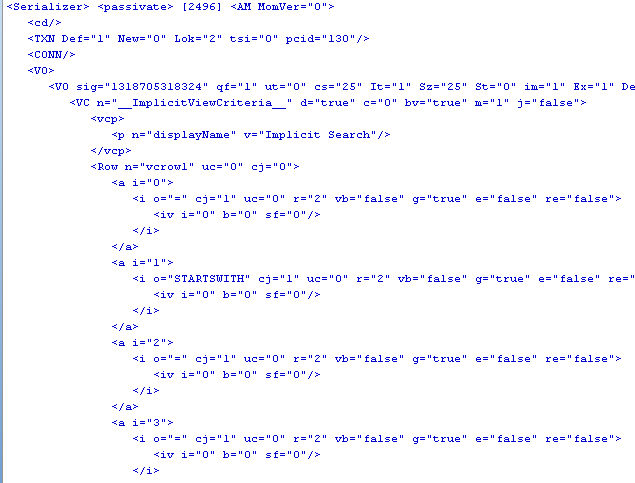 Also checked include all transient attributes. Yes, this should be sufficient - it still doesnt work? Thanks for confirming. I will let you know after testing tomorrow. What happens when there are nested AMs with different configuration sets as you described? Which AMs settings are honoured? Will the root AM override child AMs' settings? Settings from root AM will be applied to all child AMs.